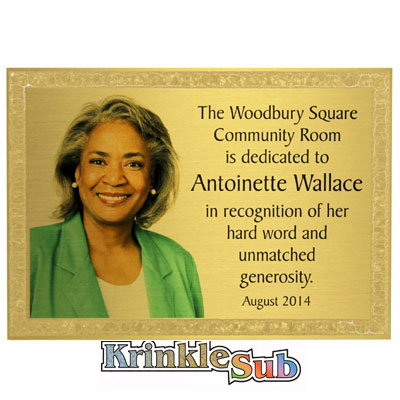 KrinkleSub® plaques are 5" x 7" plates with dye sublimation coating that has a border of Florentine frost acrylic. Looking closely, you can see the "krinkle" effect. It provides a beautiful frame for photos, text and/or engraving that touts the events and achievements of the honoree. Large trophy bases are extra special with these plates installed, digitally decorated with graphics and photos. Another option is to mount the plates on the Unisub® piano finished Ultra Gloss plaque base. The end results are heirloom quality awards and objects d'art. Bravo! Dimensions: 4.875" x 6.875" x .020"
KrinkleSub™ Plaque, Satin Gold Sublimation Aluminum by DynaSub®, 4.875" x 6.875" x .02". Combines the stunning beauty of sublimation with a krinkle frost border to give your plates that finishing touch. Lovely presentation.